LIC’s New Children’s Money Back Plan (Plan 832) – All details with premium and benefit examples. Children’s Money Back Plan (Plan 832) is one of the most popular children’s plan from Life Insurance Corporation (LIC) of India. This plan is specially designed to help parents to meet educational expenses of their children through the survival benefits available at specific intervals. Educational plans are becoming more and more relevant in the current scenario where educational expenses are sky rocketing day by day. New Children’s Money Back Plan is designed in such a way that, money backs at the rate of 20 % of Sum Assured shall be obtained on 18 th, 20 th and 22 nd year of age of the child. On the 25 th year of age of the child, the plan matures and the maturity benefit including balance 40 % of Sum Assured along with Bonus and final addition bonus shall become payable. Plan suitable to meet Educational and Marriage expenses of children having age between 0 years (last birthday) and 12 years (Last birthday) of age. Money back available on 18 th, 20th and 22 nd years of age of the child. Plan matures on the 25th age of the child. Maturity amount and survival benefits available are exempted from Income tax under section 10(10D) of income tax act. Tax rebate under section 80 C of Income Tax act can be availed on the Premium paid. Read more : Calculate your Income Tax liability using income tax calculator. Premium Waiver Benefit (PWB) rider is available as an additional option for New Children’s Money Back Plan. 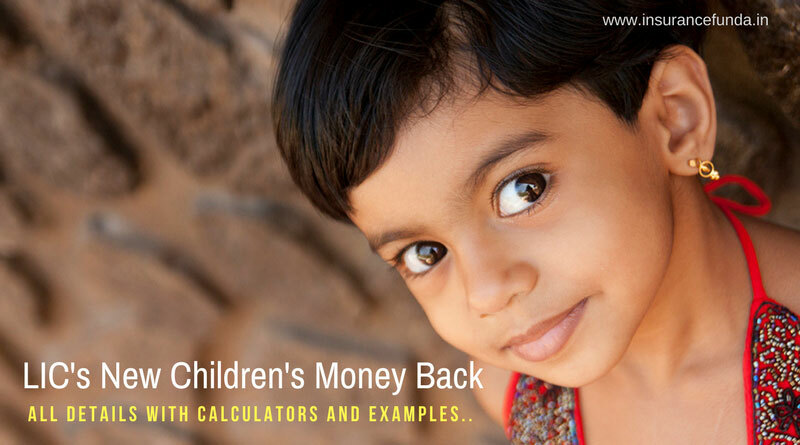 New Children’s Money Back – Calculator – is a complete online solution to understand the premium, Insurance coverage and benefit details of the policy. You can customise the plan illustration based on the age of the child and the premium you can afford. Now let us have a look at the eligibility conditions and important features of the plan. New Children’s Money Back Plan (832) – Survival and Maturity Benefits. Sample Illustration of New Children’s Money Back Plan – Children’s plan from LIC. Let us consider an example to understand the benefits for New Children’s Money Back Plan. Details considered for the illustration are given below. Survival benefit at the rate of 20 % of Sum Assured (Rs. 2,00,000) will be available on 18 th 20 th and 22 nd year. As the policy holder attains 25 years of age the policy matures and the balance of Sum Assured along with Bonus* and Final Addition Bonus* available will be paid. You can understand the full details of New Children’s Money Back Plan from the benefit illustration given below. Please note that, these illustrations are just sample illustrations to understand the plan details. If you want to get customised benefit illustration based on the details supplied by you, use the links provided below. Note# *The benefit illustrations shown above are just for understanding the basic details of the plan. Please go through LIC web site for more details. Bonus rates shown in the illustration are based on the bonus rates of Children’s Money Back Plan for the last financial year. Future benefits could vary based on the experiences of Life Insurance Corporation of India from time to time. Have any plan for children from Mar 18 for 9 years ? What is the date of birth of the child? And please mention is it for daughter or son. Loyalty addition of Jeevan Saral has not been declared for 30 year term.